Seal fresh eggs in a container together with a very fragrant Périgord truffle and refrigerate for 24 hours. Grate some of the Périgord truffle in a small bowl of crème fraiche and leave the crème fraiche to absorb the flavour for 12 hours. Cook the eggs in their shells for 3 minutes, then place each egg on a slice of boiled potato. 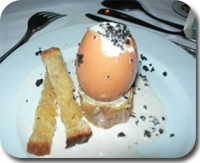 Slice the top off the boiled egg and pour the crème fraiche with the Périgord truffle aroma over it. Serve with toasted bread soldiers that have been buttered with the Périgord truffle butter.